Great Value, Affordable Hotel with Hot-Spring Fed Pool & Excellent Food. The Volcano Lodge & Springs is a rustic mountain hotel with spectacular gardens and basic room amenities. 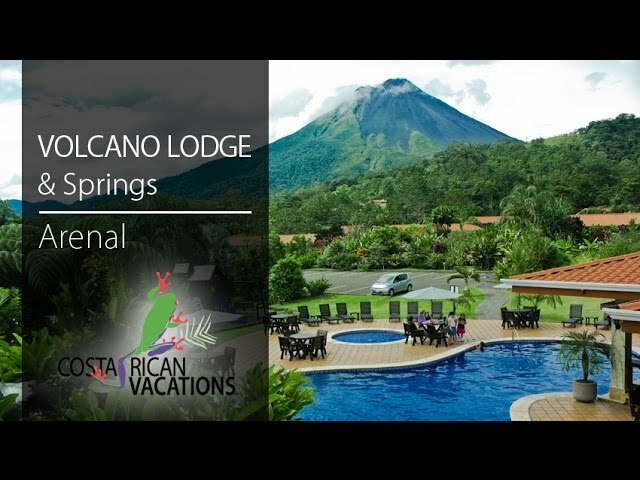 This hotel is another great value option among Arenal Volcano hotels, ideal for families and couples that want a comfortable stay near the volcano while being mindful of budget. Volcano Lodge consists of 62 Superior Rooms nestled in tropical gardens, each with its own patio and rocking chairs. All rooms come with A/C, cable TV, safe deposit box, hairdryer, and coffeemaker. Hotel amenities include complimentary WiFi throughout the property, a swimming pool with thermal hot springs, a kids pool, two Jacuzzis, a small playground, nature trails, and a modest spa with relaxing sounds of the river nearby. The hotel’s restaurant, Sura Bar & Bistro, is located next to the pool. Their tasty menu includes a variety of meat, fish, and poultry dishes, fresh salads, pasta, and snacks, as well as traditional Costa Rican dishes. They also have a sunken pool bar where guests can enjoy steamy afternoons with cool cocktails and stellar volcano views, plus a Lobby Bar with convenient gift shop located next to it. Buffet breakfast is included each day at the Volcano Lodge. Activities around the hotel include hiking, visits to Arenal National Park, and trips to world famous hot springs, located just minutes away from the hotel. Perhaps the most popular activity in the zone is the canopy tour which gives tourists the opportunity to experience nature in a truly unforgettable way. Surá Restaurant features intimate dining and rich breakfast buffets. Local tours include visits to the hanging bridges and white water rafting. Indulge yourself with one of the sensuous beauty treatments at the Volcano Spa. The hotel features lush botanical gardens filled with exotic plants and animal species. The hotel features a hot-spring fed swimming pool, perfect for relaxation and sunbathing.